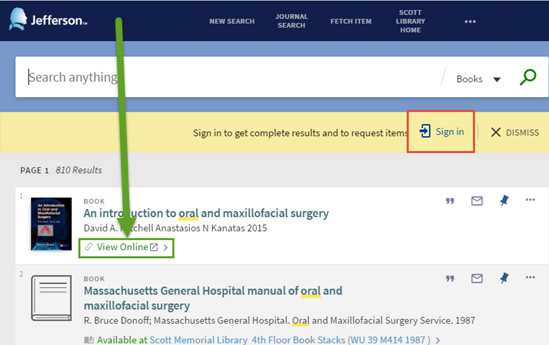 Use Scott Library's integrated search interface (or, discovery service) to find library materials and resources across an expansive selection of journals, e-books, presentations, digital objects, and databases. Read the May 15, 2017 news of its launch. Q: What is the truncation symbol? A: The truncation symbol for one or more characters is * and the wildcard for a single character is ?. A query can have up to 8 wildcards or 4 truncated terms. A: No, there is no proximity searching. Q: My Campus Key works elsewhere. Why can’t I sign in here? A: Make sure you're typing your campus key in all lowercase. If you are new to Jefferson your campus key may not yet work for the library search personalization login. In other cases, you may need to have the IS&T help desk reset your password (215-955-7975). However, clicking the view online link for an ebook or article should still work for eligible users.